UK photographers waste almost £10,000 per year in lost time and printing costs by not colour calibrating their equipment, a survey has claimed. Digital cameras, monitors, printers and scanners reproduce colours differently, meaning that the image colours on a computer monitor may fail to match those delivered by a printer, for example. Colour-management software helps the photographer achieve more accurate and consistent results. The poll, by colour-management software maker X-Rite, found that the lack of screen colour calibration costs UK photographers an average of £5,200 per year – equivalent to 4 ½ hours a week in colour correction. 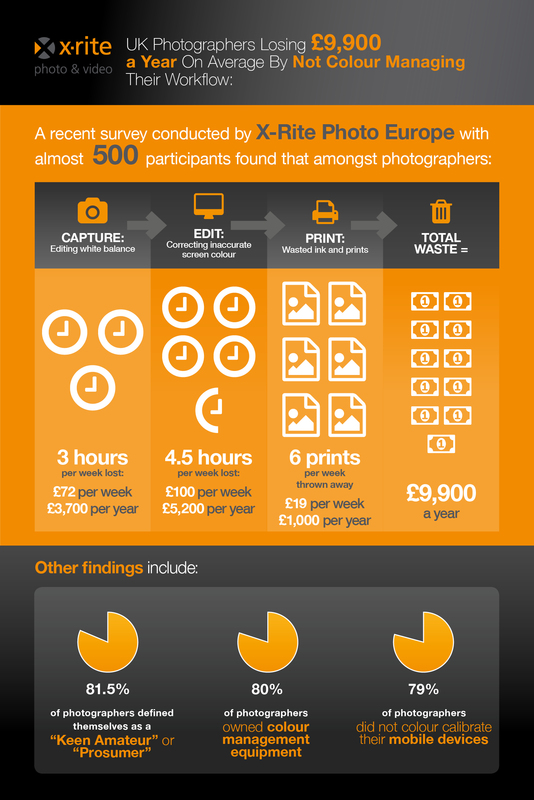 White balance editing costs £3,700 per year, while wasted ink and paper from inaccurate prints accounts for £1,000. While 80% of UK photographers said they owned colour-management equipment, only 21% said they colour calibrated their mobile device. The total time lost through lack of white-balance control or screen calibration is the equivalent to one working day per week, according to X-Rite, which received responses from around 300 UK photographers who attended its trade shows and competitions across Europe in 2014 and 2015. ‘On average, a lack of print colour management will mean 27 photographers throwing away a tree’s worth of paper per year,’ claims X-Rite. The UK results were among nearly 500 responses that X-Rite received from photographers across Europe. He added: ‘This survey has, for the first time, given us clear data on how much time is being lost by photographers who aren’t using colour management. X-Rite produces colour-management software to create a profile for all a photographer’s devices. ‘A profile provides a description of each device’s colour gamut – the range of reproducible colour,’ explains the firm on its website.